Random House, New York, 1966. 159 pages. 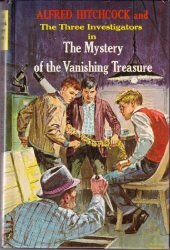 This is Book Five in The Three Investigators series. I’ve decided to post my reviews of the books in order, even though I’m reading them out of order. As I read, I remembered quite a few details from this one, probably because there are some quite bizarre things. The book begins with Jupiter discussing how he would steal the Rainbow Jewels from a local museum. The three decide to go to the museum on Children’s Day to practice their investigator skills – and while they are there, a valuable Golden Belt is stolen. Their help on that mystery is refused, but then they are asked to help one of Alfred Hitchcock’s friends, who has been seeing gnomes. It’s a bizarre case – little people with fiery red eyes peering in the windows and digging noises at night. We aren’t surprised when the two cases dovetail. As usual, I am once again amazed at what the boys’ parents let them go off and do on their own! And once again, they get into danger, but the strategic placement of a chalk question mark (and a very clever and memorable placement in this case) gets them out of it. Once again, we have a stereotypical ethnic character – this time a boy from Japan. At least the author is trying to be cross-cultural, though not perhaps in the politically correct way it would be approached today. Still no girls at all have appeared in these books, but they are still a quick-reading adventure yarn, where kids figure out a case that has adults stumped. I’m having great fun going back in time with these mysteries.